Product code: ES6524 Categories: Sold Items, Sold Jewellery. 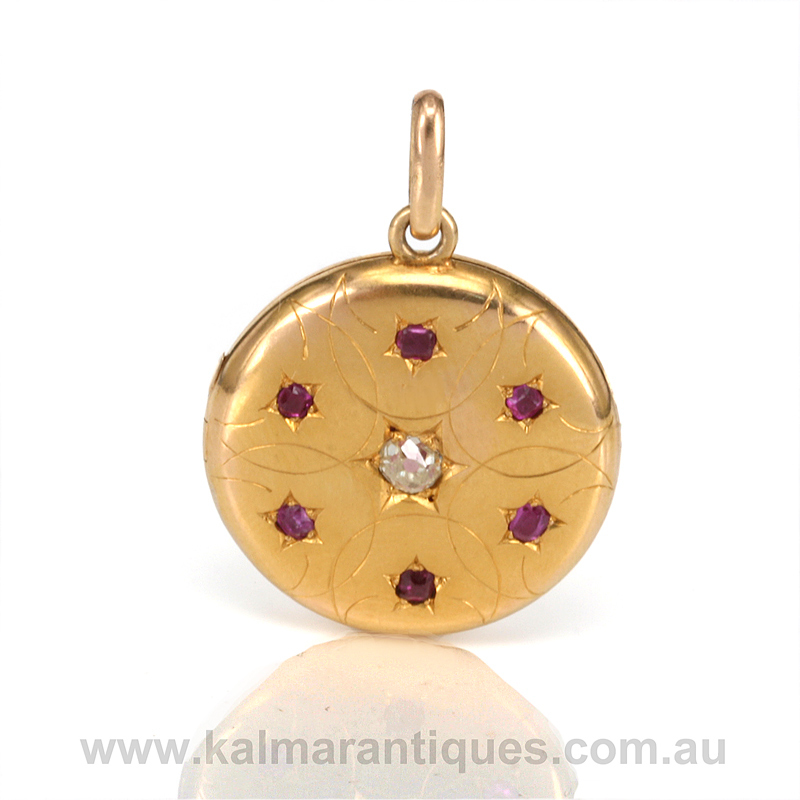 Here is a very elegant and refined Art Deco ruby and diamond locket that no matter where or when it will be worn, it will always be admired for its elegance. Dating from the very early part of the 1920’s and made in 18ct yellow gold, this Art Deco locket has styles of the “new” upcoming era as well as characteristics from the past Victorian and Edwardian eras. It has a simple elegance coming from the engraved front that is the start of the Art Deco style and moves away from the heavily engraved often with a floral motif of the Victorian period and yet the centre diamond is set in a bead design seen in the late 1800’s and early 1900’s jewellery. In total there are six natural rubies that total 0.30 carats and the centre old mine cut diamond measures 0.20 carats and the locket itself measures 22.8mm across by 30.6mm to the top of the bail for the chain. 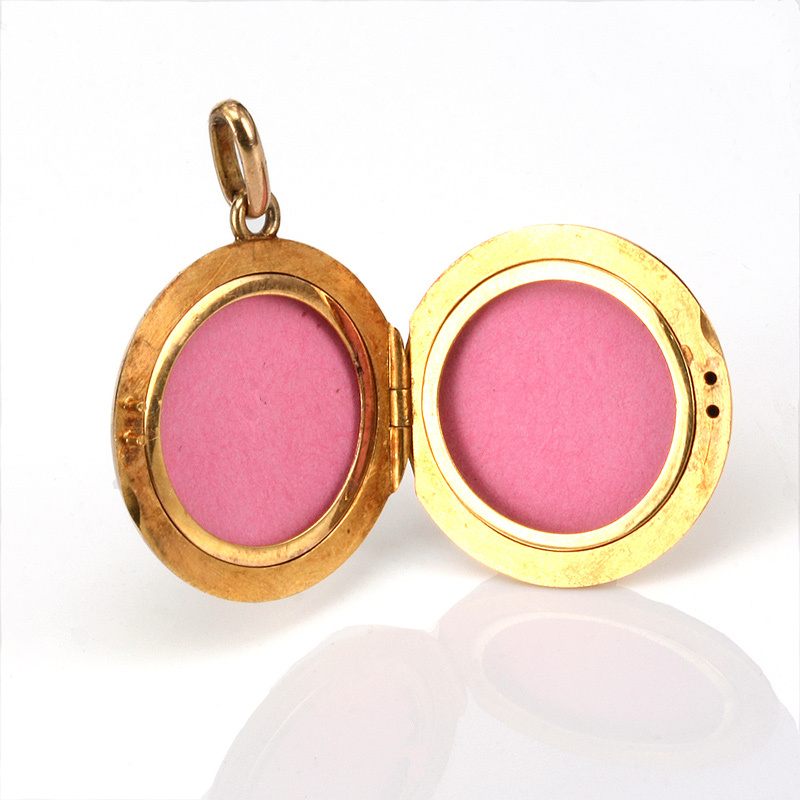 Inside it can hold two photos, and even worn as a pendant without people knowing it is a locket will have them staring in awe at its elegant and refined design. Art Deco jewellery is so incredibly beautiful and sought after and this Art Deco locket set with rubies and a diamond is certainly no exception.